The appropriately named Grand Canyon can be enjoyed from at least two different perspectives. The South Rim is more popular and open all year. The North Rim is closed in winter, but the very best time to visit there is upon us — September and early October, before most North Rim services shut down about mid-October because of early snows. In that window, weather will usually be clear, with a slight chill in the air. Olivia Wall The views into the canyon are spectacular from the deck behind the Grand Canyon Lodge on the North Rim of the Grand Canyon in Arizona. Deborah Wall Hikers stand above Angels Window just a five minute hike from Cape Royal Road at the North Rim of the Grand Canyon in Arizona. 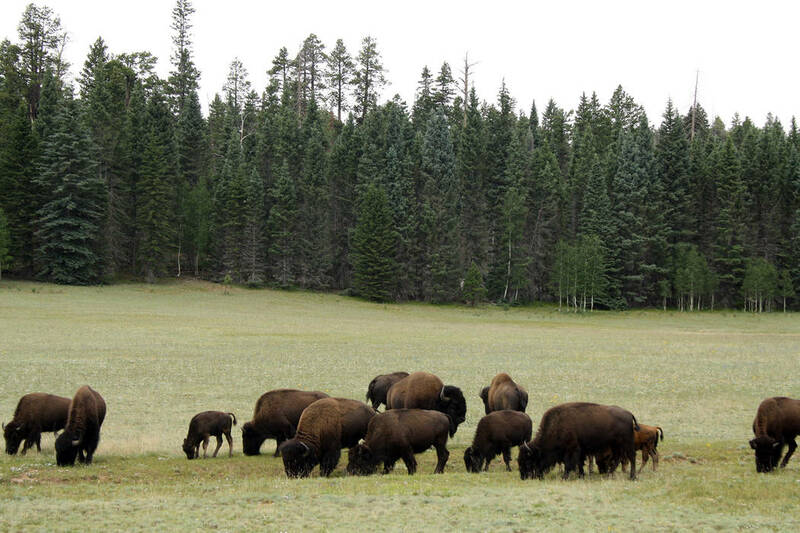 Deborah Wall Bison can sometimes be found in the meadows just after entering the main entrance of the Grand Canyon National Park in Arizona. Deborah Wall The deck at the Grand Canyon Lodge offers view of the national park in Arizona. 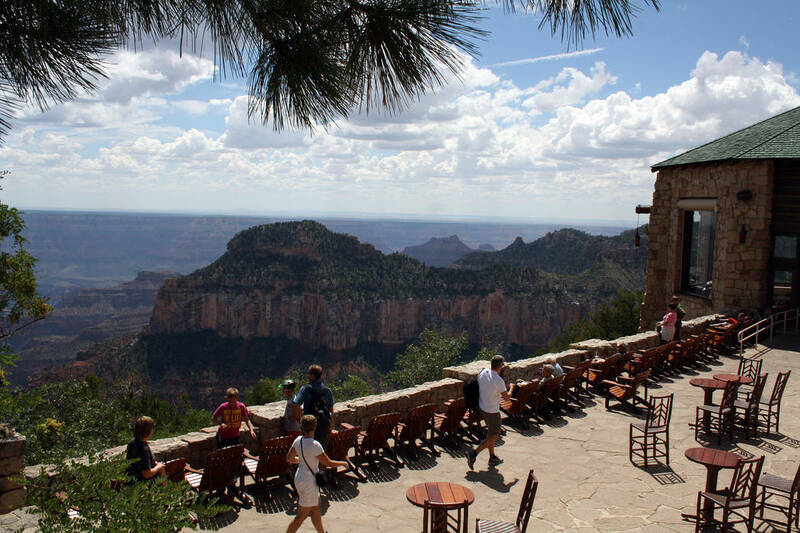 Located on the Arizona Strip — the part of the state lying north of the canyon and approachable mostly through Utah — the North Rim is less crowded at any given time, but particularly so now that summer travelers have gone home. North Rim elevations average some 8,000 feet, more than a 1,000 feet higher than the South Rim. It also receives twice as much precipitation, clothing it with lush vegetation. You will find forests of ponderosa pine, and blue and Englemann spruce, interspersed with aspen trees. From Las Vegas, it takes about four and a half hours to get there. The final 45-mile leg, from Jacob Lake, Arizona, to the North Rim, is a treat in itself. There are open lush meadows, many boasting wildflowers and small ponds, which are especially good places to see wildlife at dawn and dusk. The park is home to deer, wild turkeys, badgers, bobcats, mountain lions and even a few black bears. Surprisingly it is also, for the time being, home to a herd of bison. They usually hang out in the meadows just after the park’s main entrance gate. Management plans are underway about how to handle this herd. These are fun, because you don’t get to see bison in too many places. They’re usually docile, but any wild animal is unpredictable. Bison, despite great size and weight, are surprisingly agile, and surprisingly fast; he who loses a foot race with a bison likely loses more than dignity. Therefore, view the beasts only from the safety of your auto. The hub of the park is the Grand Canyon Lodge, located directly on the rim and surrounded by all sorts of services. There are lots of bathrooms, water stations, a ranger-staffed visitor center, gift shops, a bar, post office and a quick-grab deli with sandwiches and pizza. The lodge is Western rustic, but its lodging is pricey. It has cabins of different sizes, all with porches, or located near or directly on the rim. However, any visitor to the park can go to the lodge and take in the views, relax on the living room couches or on the deck and take in a free ranger program. The food at the lodge’s main dining room ranges from simple fare, including great choices for children, to upscale gourmet items. Make a reservation in advance and you might get a table by the window, maximizing the experience of dining amid one of the nation’s finest views. Besides all the great hiking trails in this area be sure to drive out the scenic Point Royal Road. 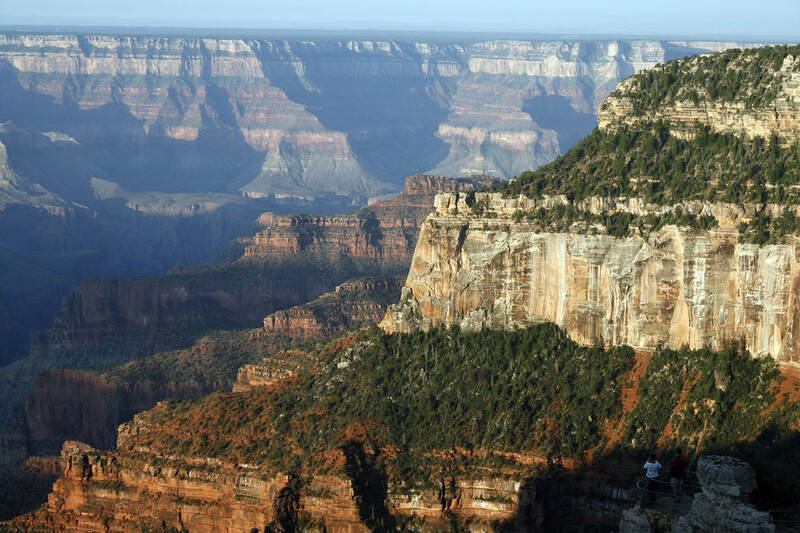 This paved, scenic road offers the very best of the North Rim. There are so many overlooks and short, easy hikes to take that maximizing the experience might require half a day. It’s worth the time. Plan on taking a picnic lunch, and enjoying the day at your own pace. Overnight accommodations are available at the Grand Canyon Lodge; Call 877-386-4383 or visit www.grandcanyonforever.com for details. Outside the park, the closest hotels to the North Rim are Kaibab Lodge, 928-638-2389 or www.kaibablodge.com, and Jacob Lake Inn, 928-643-7232 or www.jacoblake.com. North Rim Campground reservations can be made by calling 877-444-6777 or online at www.recreation.gov. The same website also handles Jacob Lake and Demotte campgrounds, which are outside of the park and make half of their sites available by reservation. Gasoline is available on the road to the North Rim Campground. 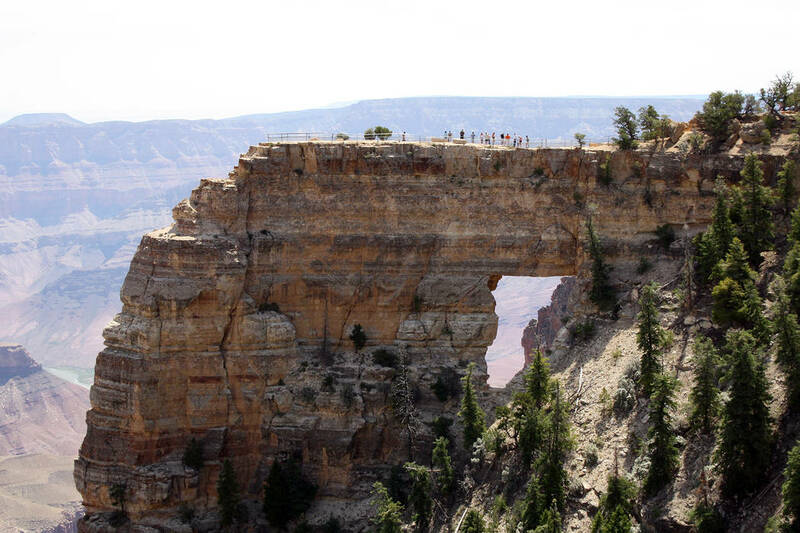 For further information on the North Rim contact the park at 928-638-7888 or visit http://www.nps.gov/grca. From Boulder City take U.S. Highway 93/95 about 25 miles and merge right onto Interstate 15 north. Drive about 125 miles to Utah Route 9, the Hurricane/Zion National Park exit. Drive about 12 miles and turn right onto Utah Route 59 east. This turns into Arizona Route 389 at the state border. Drive 53 miles to Fredonia and turn right onto U.S. Route 89 Alt. for about 30 miles. Turn right at Jacob Lake onto Arizona Route 67, the Grand Canyon Highway. Continue about 45 miles to the Grand Canyon, North Rim Visitor Center and Lodge.